In a hidden corner of the Welsh countryside, beneath the dark green hills and stretching deep underground, lies a secret. This is not the sort of book I would usually reach for, even around Halloween. Maybe especially around Halloween. But Madeleine at Top Shelf Text recommended it so highly that I had to give it a try. I’m so glad I did, because while it was an anxiety-inducing novel, it was a really well-written one. 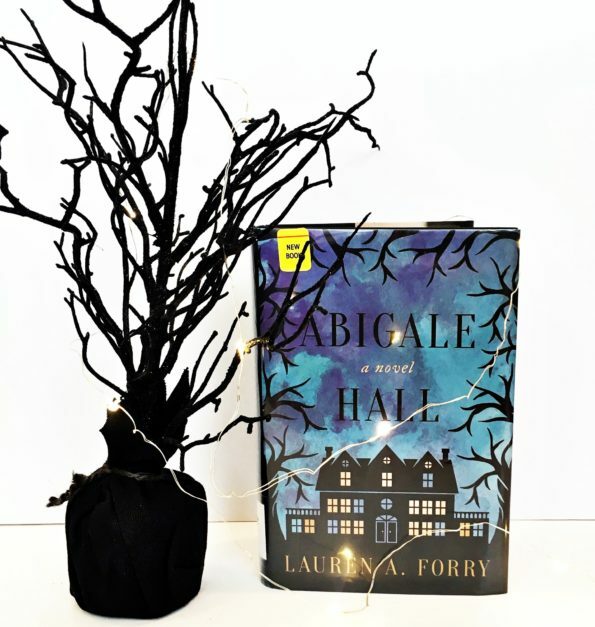 Abigale Hall by Lauren Forry is categorized as a suspense novel, but it’s written in the vein of gothic horror novels. If you want a well-written, fast-paced page-turner, this is the one to go for. 17-year-old Eliza and her younger sister Rebecca have orphaned due to various events during WWII. Their mother was killed in the Blitz, their father committed suicide, and their aunt very suddenly and mysteriously decides she can no longer care for them and they are sent to work at a crumbling mansion in Wales. They never see the owner, Mr. Brownwell, and the housekeeper, Mrs. Pollard, is . . . off. Eliza tries to make plans to escape back to London, but when she discovers a book covered in blood, she has to figure out what’s going in the house and why none of the other girls hired in the past are alive. This book made me nervous when I read it, and I genuinely feared for the safety of the characters. If the plot reminds you of Daphne Du Maurier’s Rebecca, it’s for a good reason. There are definite similarities between the two, and if you like Rebecca you’ll probably like this book too. The story is creepy and mysterious, but it’s not gory, so if gore bothers you (like it does me) don’t let that keep you from this one! WWII is the backdrop of the story, but I wouldn’t say it’s a major theme in the book. None of the characters in the book are completely likable, but it was ok because the story drew me in so much. Eliza, who frustrated me at the beginning of the book, does go through some necessary character changes, and I was completely on her side by the end. I don’t want to say much about Rebecca, because her role in the story is twisted and interesting, but suffice it to say that she definitely adds to the creepiness and mystery! Abigale Hall is a great gothic fiction story, and it’s perfect for people who don’t like to read real horror, such as Stephen King. It fits right in with books like Rebecca and Wuthering Heights, but is a bit more modern and fast-paced. Forry is a talented author, and I can’t wait to see what she writes next!